Are you a big fan of Tunisian crochet? I really enjoy the rhythm of this wonderful crochet technique. I enjoy putting the stitches on the hook and taking them off. In my mind, Tunisian crochet is like marrying the best of crochet and knitting! In fact, many of the stitches in Tunisian crochet look just like knit stitches (at least on the right side of the work). If you’ve never tried Tunisian crochet, what are you waiting for? Why not give it a try today? 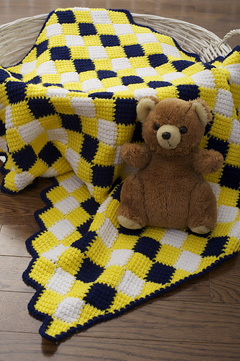 This is the Harlequin Blanket. It is worked in the entrelac method of making squares and attaching the new square to the previous square as you go, so there are no seams involved. I’ve seen this technique before, but I’ve never tried it. I intend to do that one of these days because it looks like it would be relaxing to make, but have enough interest to hold my attention! This is the Sherbet Stripes Blanket and Hat. I LOVE the colors in this set! 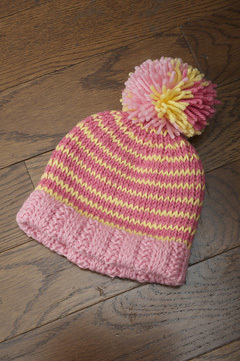 And I also love how the hat is made with Tunisian knit and purl stitches, which look just like a knitted hat! The blanket is made with Tunisian simple stitch and edged with crocheted shells. I’m looking forward to learning to decrease stitches in Tunisian crochet by making this baby hat someday soon! This is the Nursery Box filled with the Washcloth Quartet (4 different washcloths). 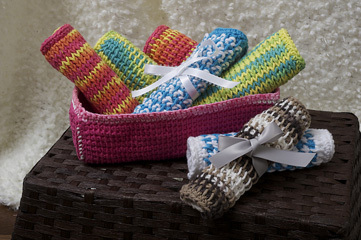 I LOVE quick projects, and these washcloths are just that. They’d make great baby shower gifts for any mother-to-be! Besides the wonderful projects, another thing I really like about this book is the charts showing which stitches are worked in each row or round. I’ve never seen Tunisian crochet charts before (or never really noticed them). I really like being able to see visually what the written instructions are saying to do! So if you’re looking for a really nice book with Tunisian crochet projects to make for babies, I hope you’ll consider adding this book to your crochet library! You can check out all the projects in the Look Book that Stackpole Books has on their website here. The book is available in paperback or as an ebook in pdf format through Stackpole Books here or as a printed book through Amazon here. As a bonus for this blog tour, I’m having a giveaway for a pdf download of this book. The giveaway runs through October 8th. To enter the giveaway and receive a complimentary, instant pdf download of this fabulous book, simply leave a comment on this blog post to be entered. The lucky winner will be randomly drawn and announced on October 9th. Good luck and happy crocheting! This entry was posted in Blog tour, Book review, Crochet technique, Giveaway and tagged crochet book, crochet techniques, giveaway. Bookmark the permalink. Welcome to the Crochet Architect website. It’s great to have a new crocheter among us! 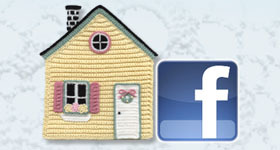 Have you checked out CGOA (The Crochet Guild of America) yet? It’s a wonderful organization that is dedicated to all things crochet! The CGOA website is http://www.crochet.org. Good luck in the giveaway and happy crocheting! I have done some Tunisian, but it has been a while. Looks like this book has some fun patterns. This book has a lot of fun Tunisian patterns! Good luck in the giveaway! Would love to win this book! Thank you for the opportunity. I’ve just started playing with the Tunisian technique. Would love to have this and find different patterns to get me better acquainted for the more challenging projects I have in mind! It sounds like this would be a great book to help you learn more Tunisian crochet techniques! Good luck in the giveaway! I would be delighted to win this book of Tunisian baby patterns! Thank you! 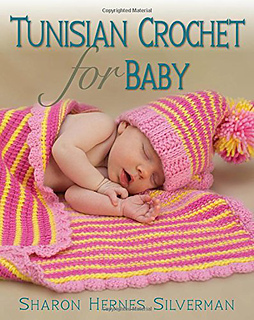 This is a wonderful book of Tunisian baby patterns! Good luck in the giveaway and happy crocheting!